Learn about solution sheets, where you will provide the optimal solution for an exercise in a spreadsheet course. The following naming convention should be used for the solution sheet: Exercise <exercise number> - Solution . 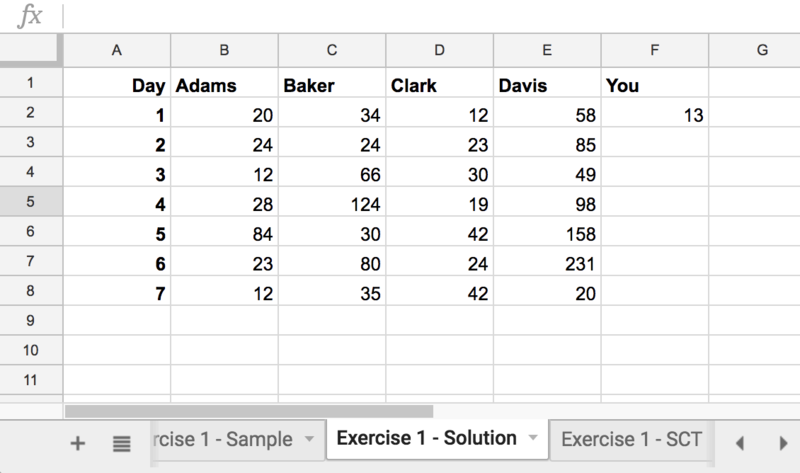 Please note that the solution data of an exercise should only differ slightly from the sample data. This also means that it should also only differ slightly from the data in the Golden Copy. This is a good time to explain which data is recorded in the Golden Copy instead of the solution or sample data of exercises. Golden Copy: all data is recorded. The user will see this sheet as you see it. Solution/Sample data: the content in the sample or solution sheets will be controlled by the data_selectors field in the Meta sheet. By default, the following data is recorded: differences in values, differences in formulas, differences in number format, pivot tables, and charts. Note that styles can also be recorded, but only if you put it in the data_selectors attribute. To modify your sheet to contain these features, you will need to change the Golden Copy and hit Reset Workbook in the preview to see the changes. Note the Reset Workbook button looks like the following next to the Submit Answer button after Preview is pressed.